All of the fuel-injected BMWs have a fuel pump inside the tank, with hoses that can be somewhat complex to understand. Furthermore, incorrect connection of these hoses can yield long-term problems. For this discussion I'll focus on Oilhead fuel tanks, partly because I have one convenient for pictures and partly because these models seem to be the target of most of the confusion. The K1200RS/GT/LT tank is similar; more details on the internals and how they differ will be described in a following issue. The four main hoses connected to the plate. The plastic ring on the pipe where the drain line connects identifies that as the drain. The filler neck drain is actually the most problematic in my experience. This hose runs from the underside of the filler neck (look under the cap and you'll see a small hole at 9:00, this is the drain) through the tank to a pass-through pipe on the plate. From the outside, another rubber hose runs from the plate to somewhere near the right footpeg. The external hose is marked with X-X-X or XXXXX so you can keep track of it, but often the internal one isn't. The second small hose, the vent line, runs from the vapor vent inside the tank to the plate and then to the charcoal canister. If the canister has been removed, this line should run with the filler neck drain hose down by the footpeg. 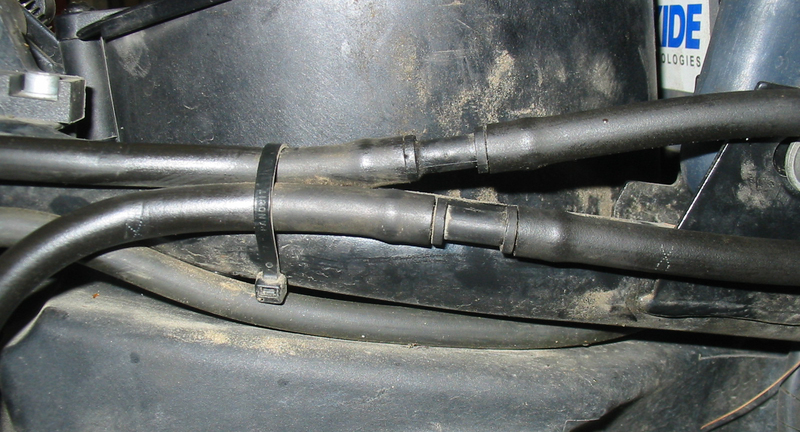 Both of these vent hoses normally have disconnect fittings tied to the right frame rail under the seat. Vent and drain hoses at the right frame rail. Notice the X marks on the lower (drain) hose. One common mistake is to cross-connect them after removing the tank. It's easy to do, because the way the factory usually connected the lines at the tank (drain line lies on top) is the reverse of how they would lie at the disconnect fittings, so you usually need to cross them somewhere. No matter; you should be able to determine which is the drain line by looking for the X on the hose. If you can't find them, open the filler cap and blow into one hose. If you feel air coming out of the drain hole, that's the drain line (!). If you blow into the vent line, you will find that it feels like it's almost clogged. This is because the vent hole in the trap is very small. On a model with a tipover valve on the vent, you will not be able to blow into it at all if the tank is not upright. The outcome of crossing the hoses is that rainwater from the drain goes to the canister, which fills with water and gets clogged. Then water will no longer drain through the line and will back up into the filler opening. When you open the fuel flap, that water goes into the tank. 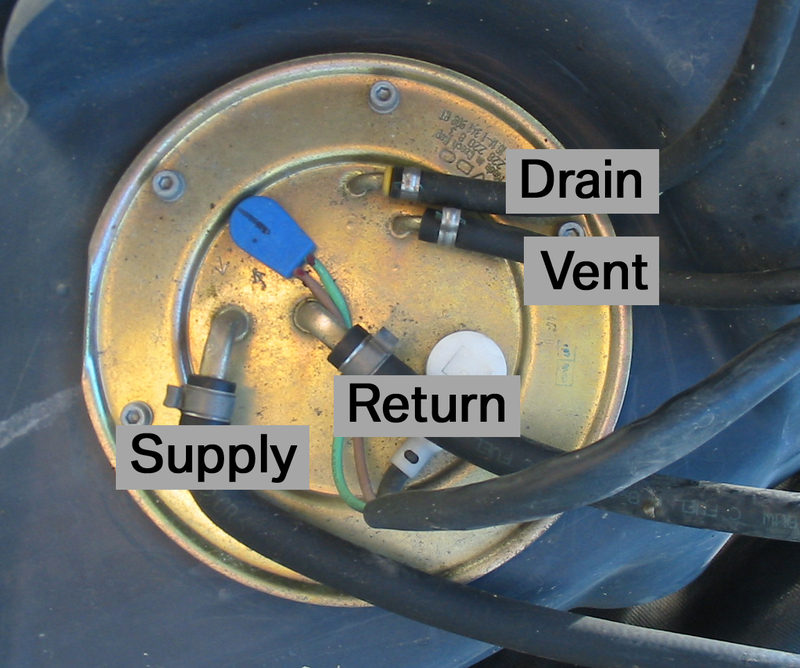 A secondary effect of this is that once the hoses are reconnected properly, the tank will no longer vent properly because of the clogged canister. Another problem is that the steel tube where the lines go through the plate will clog. Usually this affects the drain line, with the obvious symptom being that water remains in the filler neck area. Every time I change the fuel filter on one of these bikes, I verify that these lines are clear. About one out of five times, the drain line is clogged! Additionally, one can pinch these lines when reinstalling the tank or possibly when reinstalling the plate. The lines are not always long enough to allow you to remove the plate and all of its parts from the tank, so you may need to remove them from the inside of the plate. Sometimes they can be worked off but usually I release the clips holding them on by pressing the clasp sideways with a screwdriver. Pushing the clamp apart with a screwdriver. These are the 10mm internal lines. When reinstalling, be sure that they do not get tangled in the float arm! Some people have tried to lengthen them to make plate removal easier, but have found that the lines then foul the float. Early in the R1100 history BMW made a change to the length of these lines for the same reason. On early bikes the internal hoses are nominally 8mm OD on later bikes they are 10mm (in both cases the actual measurements are larger). External hoses are, in real dimensions, 9~10mm depending on the year. With age these lines can split, and replacement is very straightforward. See the end of this article for part numbers. Vent hose is sold by the meter; one meter of each type (X and plain) is enough to replace the hoses back to the connection fittings. The fuel lines are simpler, because the lines do not cross when connected normally. The lines leave the tank in a natural over/under orientation which matches the upper and lower pipes on the fuel distributor. The lower line supplies pressurized fuel to the regulator and injectors, while the upper line returns low-pressure fuel to the tank. Starting in the early 2000s most bikes were equipped with quick-disconnects manufactured by CPC. If you don't have them, you will probably want to use fuel line shut-off clamps when removing the tank, to keep fuel from flowing out of the return line. Note that the lines inside the tank are different than those outside! If you are relocating the fuel fiter and need to add hose inside the tank, or want to replace some existing hoses inside the tank, you must not use the same line that is used outside the tank. It will not resist immersion in fuel; the correct line is fuel resistant on the inside and outside whereas standard fuel line is only fuel resistant on its inner surface. There was a recall revolving around the possibility of loose crimps on the fuel lines and damaged O-rings in the disconnect fittings, but the use of the fittings remained through the end of R1150 production and even on the R1200 models. I find the disconnect fittings useful and have added them to my own motorcycles, but some people have removed them for reliability concerns. The two most likely problems are a damaged O-ring from sloppy reassembly, or a broken male disconnect fitting. To reassemble these, wipe all of the dirt from the male side and apply a thin film of grease to it. Press the latch on the female side and carefully press them together. Once they are partially engaged, release the latch and continue pushing them together until you hear and feel the latch click. As for the breakage issue, BMW has now updated the male fitting to a metal part rather than the original plastic. The vent lines are held on by CLIC-R clamps. These can be released by pushing the two halves sideways until they slip apart. They can easily be reconnected by the use of angled flush-cut end nippers, which will catch both sides without interfering with them as they squeeze back together. Better yet, buy pliers specific to these clamps; using them one way opens the clamp and using them the other way closes them. Since those connections are immersed in fuel, it's important that they are secure or else fuel can leak into the lines and then into the canister or onto the ground. Still inside the tank, the fuel lines are secured at the factory by Oetiker size 16 crimp-type clamps. When the fuel filter is replaced for the first time, threaded clamps are typically used to facilitate future changes. 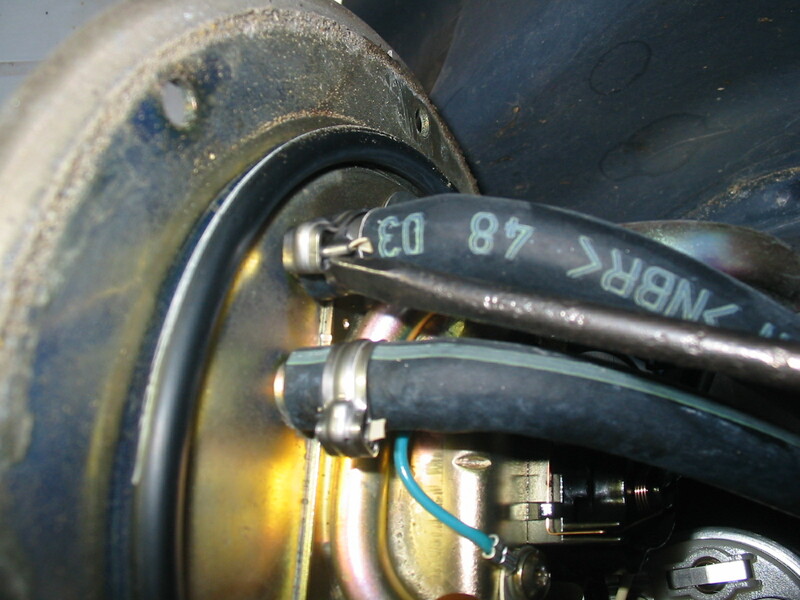 Crimps are also used at the external connections at the tank, at the fuel distributor, and at the disconnect fittings (if present). When installing disconnect fittings, I use the crimps because they are much smaller and have less tendency to cut the hands of the person trying to assemble and disassemble the fittings in the future. When removing the tank on a motorcycle without these fittings, I always use threaded clamps. External fuel lines are 5/16" R9 fuel hose, and I use 13mm threaded clamps because the 12.5mm clamps are just a little bit too tight to slip over the end of the hose. Inside the tank, you MUST use R10 fuel line (rated for immersion in fuel) and I use 12.5mm clamps. At top, male and female quick-disconnect fittings (made by CPC). 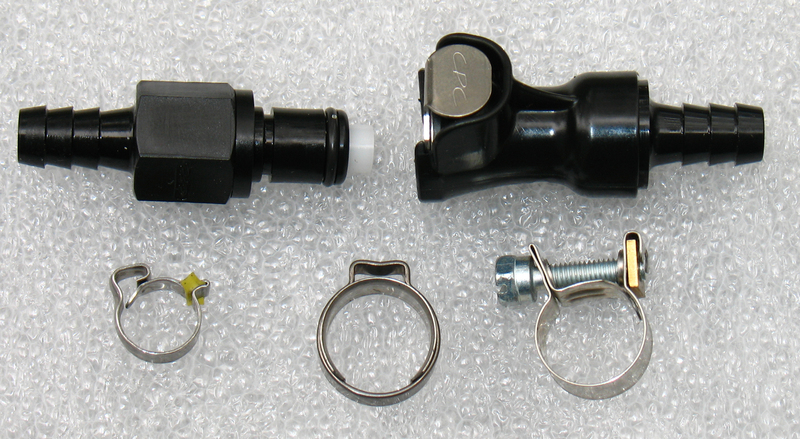 Bottom: CLIC-R 55/80 clamp, Oetiker 16 crimp, and Gemi (BMW) 12.5mm clamp.